Some varsity football programs are struggling across Virginia because students aren’t showing up to play the game. Jessica Jones stands nervously at the sidelines of the Mount Vernon High School football field. Her son is the quarterback of the visiting team, the Edison Eagles. She’s nervous because she doesn’t want to see her son end up in the hospital. 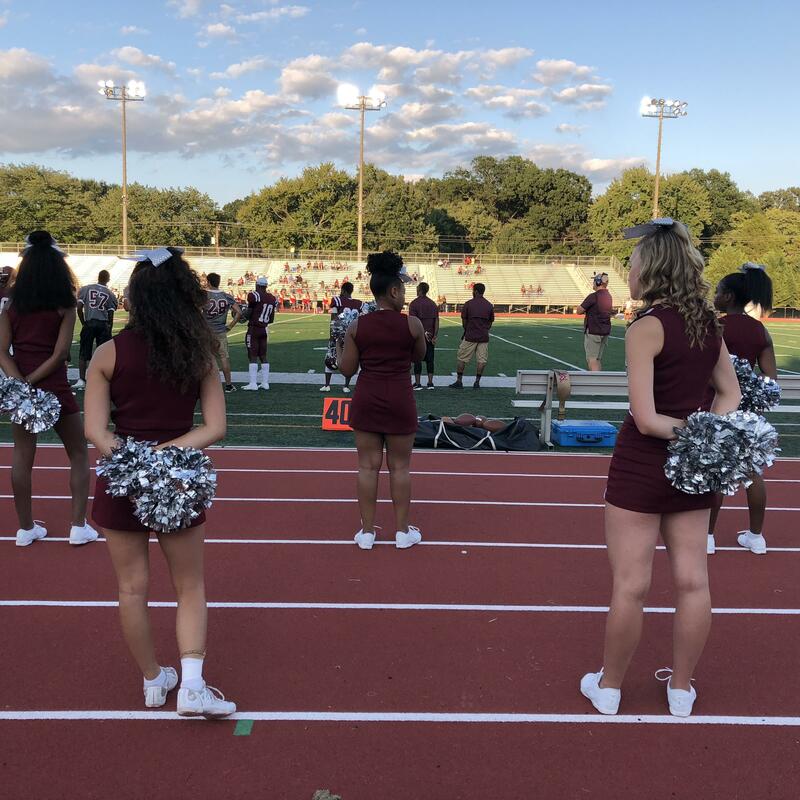 Cheerleaders for Mount Vernon High School watch as their team takes on the Edison Eagles. The football season here in Fairfax County is alive and well. But that’s not true everywhere in Virginia. In Charles City County, near Richmond, the high school started practice this year with 16 players. Over the course of the first week of practice that dropped to eight players. By the second week it was one or two players. Superintendent David Gaston had to cancel the season. "It was very much a shock, I think, to the community, as you can well imagine because we were just as shocked in the sense that we were really weren’t expecting to see that kind of a drop in the interest so fast as it did over the course of just one year,” Gaston says. 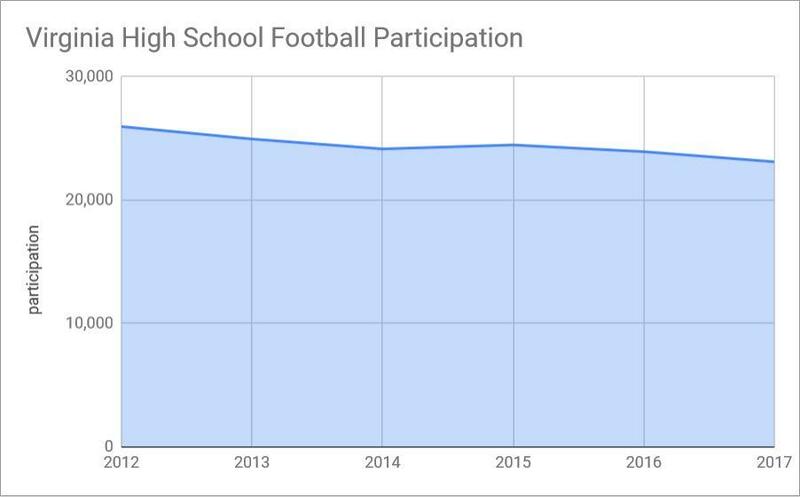 Across Virginia, several high schools are cancelling their varsity football seasons because students just aren’t showing up in the numbers they used to. And cancelling a season of varsity football is not just a shock to the community. It also has some unintended consequences. Just ask Tony Lampe. After Park View High School in Sterling cancelled its football program, his son transferred to Dominion High School to play on the team there. After the season, he wants to transfer back to Park View to play soccer. But the rules prevent parents from moving their kids from school to school so their kids can move from team to team. "My son would like to have the option to finish the football season at Dominion and then return home with his friends since first grade and compete in whatever other sport he wishes to compete in.” At this point, Lampe’s not sure if the rules will let that happen. Over the last five years, the number of high school athletes playing football has dropped 11 percent, according to statistics published by the Virginia High School League. The number of schools with football programs actually increased from 303 in the 2012 school year to 307 in 2017. Football still has the biggest participation of any high school sport (23,156 total athletes in 2017). Track and Field finishes second (20,217 total athletes). This year, though, at least three high schools have canceled their varsity football programs. More may be on the way because, for now, the rising generation of high school students just doesn’t seem as interested in playing football. This past spring, the NFL acknowledged for the first time, that there’s a connection between players’ head injuries and chronic brain disease. What’s followed is broader public acceptance of what many scientists already knew. Last year, researchers at Virginia Tech began the largest and longest study of football related head injury impact on the youngest players.